F.W. 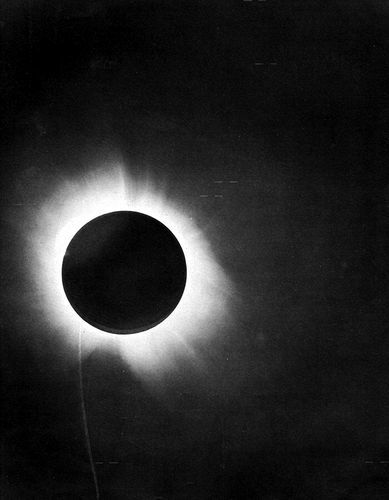 Dyson, A.S. Eddington, and C. Davidson, "A Determination of the Deflection of Light by the Sun's Gravitational Field, from Observations Made at the Total Eclipse of May 29, 1919", Philosophical Transactions of the Royal Society of London. Series A, Containing Papers of a Mathematical or Physical Character (1920): p.291-333, on p.332. This image was of immense significance as it was an essential piece of the proof that light was effected by gravity which was postulated in Albert Einstein's theory of general relativity. The significance of this event was portrayed, not entirely accurately, in the British drama Einstein and Eddington produced by Company Pictures and the BBC, in association with HBO. It was first broadcast on BBC Two on 22 November 2008.